Hello all! Just thought I'd take a few minutes and update you on how school is going and how I'm balancing everything. So far so good. I think I'll be OK. I'm taking Organic Chemistry and Human Anatomy and Physiology this semester at Scottsdale Community College. I have O-Chem Monday/Wednesday and A&P Tues/Thurs. Both classes start at 5:50pm. I haven't had any trouble this past week leaving work and getting to school on time. I've been early every day! A&P is my favorite. I get excited to go to class because it's all so interesting. I LOVE the human body and even more so now. So, obviously this class intrigues me. My teacher is super cool too. He can't be much older than me and is super laid back and chill. It'll be a good class. The lab is pretty neat too. A LOT of memorization but I think I can handle that. I've always been good at memorizing things. I just can't get behind! I spent most of the weekend getting organized. I got some school supplies, etc and well just got organized. I had to. I can't stand dis-organization!! 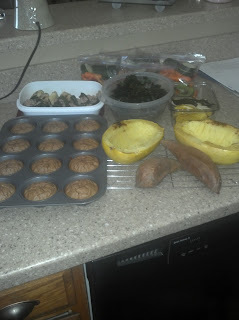 I also spent a couple hours today doing food prep for the week. I really feel like it's the best and easiest way for me to make sure I eat healthy throughout the week. When you are busy it's so easy to eat unhealthy because it's fast, but if you have food prepared it makes it so easy to have dinner ready to heat up when you get home, or even better, a good meal on the go. I have a "lunchbox" with ice packets so I bring that to me to work and school. Wednesday and Thursday's are long days with my labs so I have to have something to eat in between! I have also been really good about the gym as well. Last week I missed 1 workout because I had my pool party and I was too busy getting ready for it to fit it in, but that's OK...that's the only workout I've missed in 5 weeks. I hope to catch up this week and work out 5 days instead of 4. We'll see. I really do love this program by James Wilson! It's awesome. So that's the update from here. I hope you all are having a great month. Can't believe September is around the corner. Hopefully it'll start cooling down here soon!